Start in Iquitos and end in Nauta ! With the river cruise tour ARIA AMAZON - Discovery Cruise 3 Night - High Water Season (November-May), you have a 4 day tour package taking you from Iquitos to Nauta and through Iquitos, Peru and 2 other destinations in Peru. 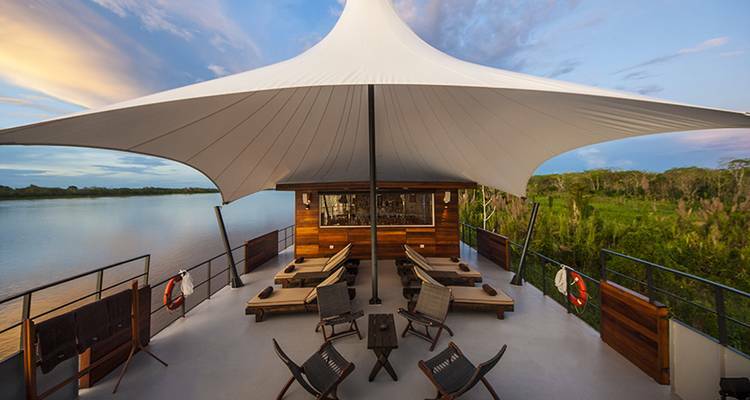 ARIA AMAZON - Discovery Cruise 3 Night - High Water Season (November-May) includes accommodation as well as meals, transport and more. Is it better to book the Aria Amazon early or can I book on short notice? With a smaller capacity than other cruise operators being a big point of difference for the Aria Amazon, it is highly recommended to book as far in advance as you can to avoid missing out on availability particularly if your travel dates are not flexible as people generally book 10 to 18 months ahead. How old do you have to be to cruise on the Aria Amazon? The minimum age requirement to cruise on the Aria Amazon is seven. To travel in a cabin without a parent or guardian there is a minimum age of 21. If you are under the age of 21 then you will need to have another traveller in the cabin with you who is at least 25 years old. The only time they will allow a traveller under the age of 21 to travel in your own cabin is if you are in an interconnecting cabin shared with a parent or guardian. TourRadar only requires a deposit of $99 to confirm this Aqua Expeditions booking. The remaining balance is then payable 90 days prior to the departure date. For any tour departing before 20 July 2019 the full payment of $3,888 is necessary. No additional cancellation fees! You can cancel the tour up to 90 days prior to the departure date and you will not need to pay the full amount of $3888 for ARIA AMAZON - Discovery Cruise 3 Night - High Water Season (November-May), but the deposit of $99 is non-refundable. Covering a total distance of approx 1,241 km.